I don’t play too many roguelikes, not because I don’t like the gameplay, but because I’m a bit of a stickler for graphics. I don’t need all my games to have Infinity Blade-level graphics, but I need more than just a few pixels that might or might not resemble a person. I like games that entertain my senses and look like art. 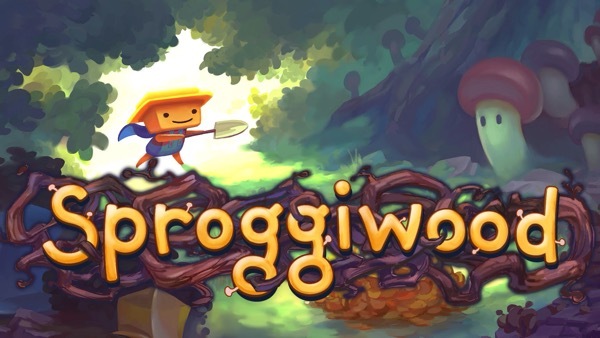 And in that regard, Sproggiwood, by Freehold Games, more than delivers. The graphics in Sproggiwood are cutesy but unique. The whole world is just bursting with character. Slimes are square instead of round and spiders are a lot cuter than spiders probably should be. Even the bosses are hard to be scared of — that is, until they destroy you. There’s also a charming, humorous story to go along with it. The sound effects and music are also top-notch. It’s not unusual for me to to shut the music in games that I spend a lot of time with, as I find so often that it gets old and eventually grates on my nerves. But the music in Sproggiwood is both relaxing and interesting at the same time. It also varies quite a bit to keep it from growing stale. The sound effects are also spot-on, from little squishes to explosions and whirling swords. Controls are fairly basic. Each game you play creates a procedurally-generated dungeon, so you won’t get the same game twice. The game is turn-based, so nothing happens until you make a move. You have a directional pad on the right with an hourglass in the middle. You can move one spot on the grid at a time or press the hourglass to skip a turn. With each move you make, the surrounding monsters will also take a turn. You walk into an enemy to initiate a regular attack, but the enemy will fight back if you don’t kill it or immobilize it with that attack. Enemies also attack if they land next to you, so a lot of strategy is involved in how you move. On the left side of the screen are your skills, which vary by character and are unlocked when you level up. Each class has four possible skills that can be unlocked and then leveled up three times for more power and utility. But your level starts back at 1 each time you begin a new game, since this is a roguelike and not an RPG. There are six characters to unlock, each with their own unique weapons and skills that make them each feel like a completely different experience. There’s a farmer, archer, warrior, ninja, vampire and wizard. Skills include arrows, bombs, traps, invisibility, spinning attacks, magic missiles, and more. You also get a nice coin bonus for each character you complete a level with. This gives you an incentive to play with and master all six characters and not simply stick with your favorite. The game starts off pretty forgiving, easing you into it. But the difficulty ramps up quite a bit after the first few locations, so even the most skilled players won’t breeze through the game. There are also three difficulty modes — easy, normal and savage — to suit just about any skill level. 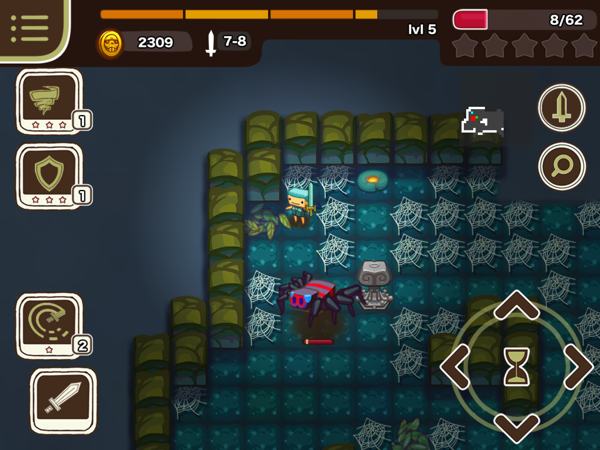 Each enemy behaves differently and requires a unique strategy. For instance, blue slimes leave puddles behind when they die, which will spawn more blue slimes after a few turns if you don’t walk over the puddles before they re-spawn. 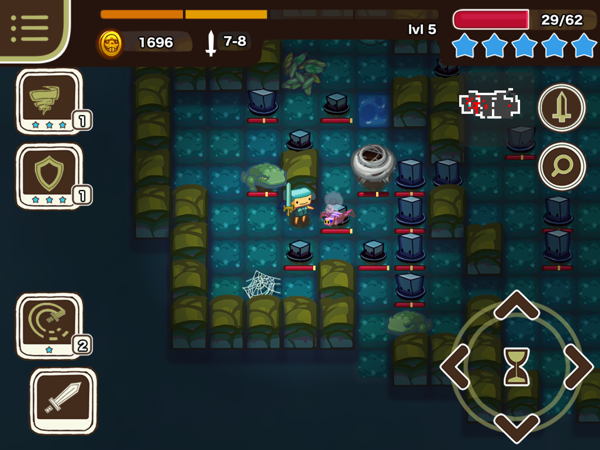 You could potentially end up with an infinite army of slimes after you if you let it get out of control. Meanwhile, other slimes leave puddles that damage you if you walk on them. And other enemies explode in a certain pattern one turn after they die. If you don’t get out of their way, you’ll get hit. There are so many different kinds of enemies that it’s unlikely you’ll get bored anytime soon. There’s also a ton of loot to find. Weapons and armor come with all sorts of effects, ranging from ice to fire to giving you a chance to teleport when attacked. Besides the various types of weapons and armor, you’ll find spell scrolls and potions that can heal you, scramble your skills, or summon friendly monsters to aid you. They can even turn your surrounding enemies into vases, which drop coins and items when smashed. There are also shrines that will do something random like freeze all enemies or even summon a whole lot more of them to attack you. This means each time you use an altar, it’s a gamble. But the games are so short, it would be silly to skip altars out of fear. Even crazy, outnumbered deaths are entertaining, as you just dust yourself off and start again. There’s a great sense of progression in the game, so those who usually avoid roguelikes because of permadeath would find a lot to like here. 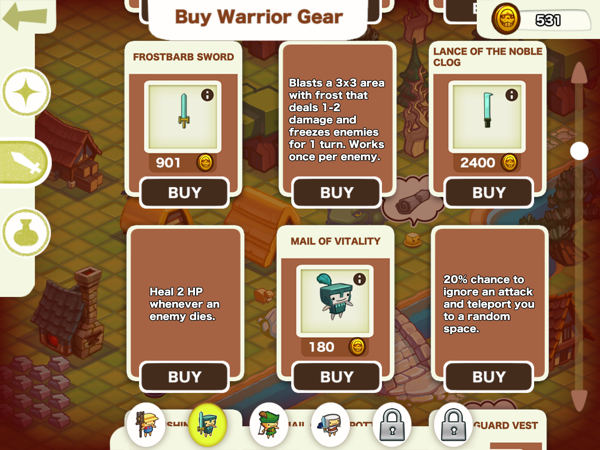 Weapons, armor, scrolls and other items you find in the dungeon are added to the shop, where you can use your coins to buy them. This allows you to start a dungeon with your favorite gear instead of waiting for it to drop. It reminds me a lot of Raptisoft’s Solomon’s Boneyard, one of my favorite survival games. 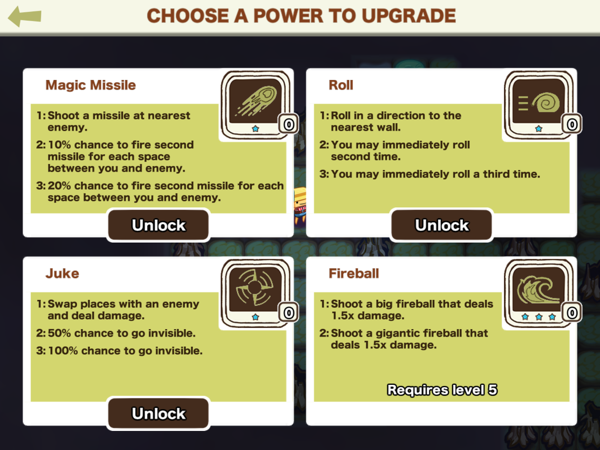 You can buy upgrades that help you survive longer, and there’s strategy involved in choosing what to take with you and what to spend your earnings on. 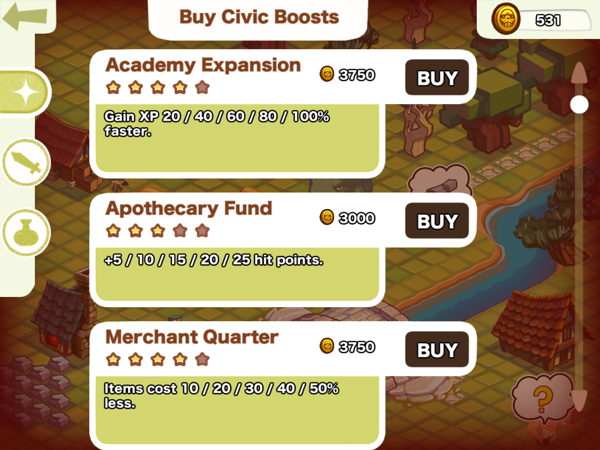 Besides gear, you can also upgrade certain things called “civic boosts” in the village that will give your heroes more health, more experience, more drops, or even cut the prices of all shop items. Coin drops and prices are fair enough that you’ll be able to progress at a decent speed, without feeling like coins are worthless or prices are too high. And since there are no in-app purchases (IAP), the game feels balanced, rather than tweaked to get players to spend real cash on better gear. It hits just the right spot to keep you wanting to play one more game each time you die. 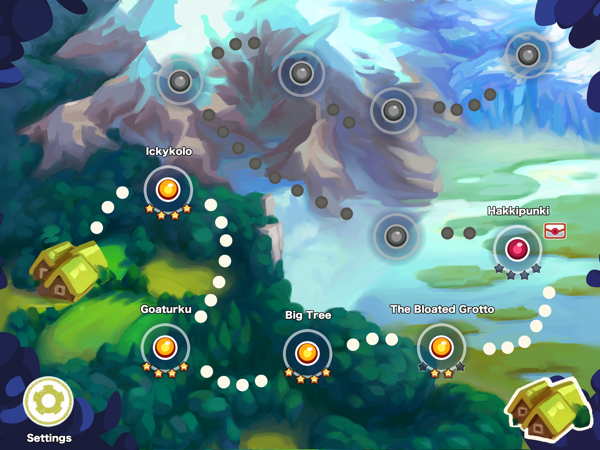 The game also takes you through a story with ten different locations and bosses. So you’re not starting from the same place every time — you progress through the story. You will likely also want to play through with all six different characters. I’ve sunk quite a few hours into the game already and have only gotten through the first four locations with the first four characters. So it looks shorter than it actually is. My main complaints with Sproggiwood have nothing to do with the gameplay itself. I wish the game had iCloud so I could play the same game on my iPad at home and then take it with me on my iPhone. I’m currently only playing on my iPad because it looks so great on there. But it would be nice to be able to grind a bit and earn some coins while I’m out. Since a game can be played in ten to fifteen minutes, it would be perfect for on-the-go play. 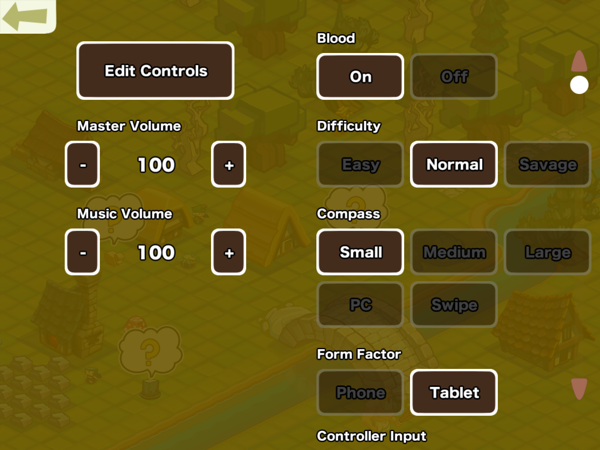 The turn-based system also helps, because you don’t have to worry about getting distracted while playing. In fact, one of the reasons the game will likely take me a while to beat is that I’m waiting for iCloud capability, which the developer has already stated is coming in an update. Those with two devices may want to choose one device to play on until iCloud is enabled, so efforts aren’t wasted on two separate games. The other issue is that it doesn’t have any auto-save feature if the game quits in middle of a dungeon. It does save your earnings, but if you’re having a particularly good run and think you’ll be able to defeat the boss, don’t quit the app! Still, each run is short enough that this shouldn’t deter you from getting the game if you’re a roguelike fan. 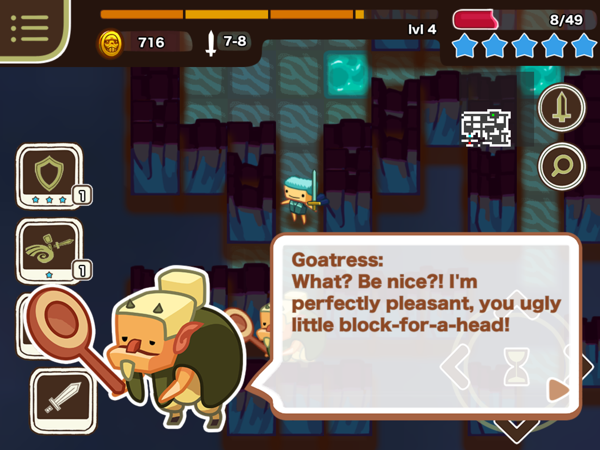 Overall, Sproggiwood translates exceptionally well to touchscreen devices and makes a terrific mobile game. The main thing holding it back is lack of iCloud, but that shouldn’t affect players with only one device. 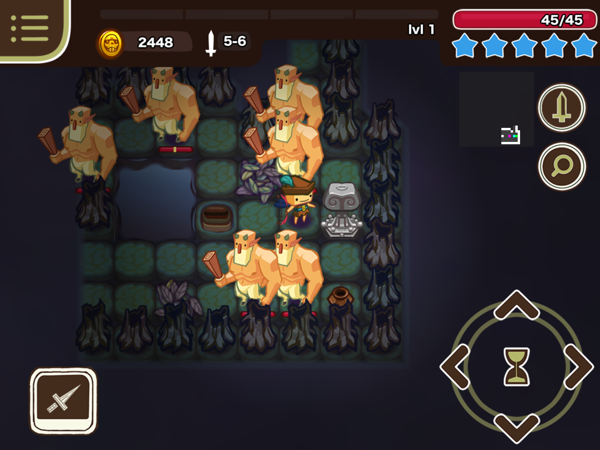 If you’re new to roguelikes or just looking for a unique one to play, you really can’t go wrong here. There’s a huge satisfaction when you find some new piece of loot or finally defeat that level you were having trouble with. So give Sproggiwood a try and download it here.